*Late TLC member Lisa “Left Eye” Lopes is being remembered by the former head of her record label nine years after she was killed in a car accident in Honduras at the age of 30. On April 25th 2002, Lopez was driving her brother, sister and two friends around Honduras while vacationing in the country. The singer attempted to pass another vehicle when a car approached from the other lane. Attempting to swerve and miss the oncoming vehicle, Lopes crashed into a tree at high speed and died of neck injuries and severe head trauma. 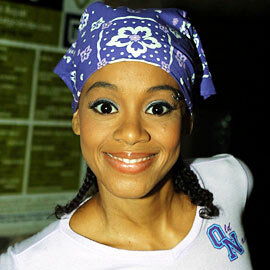 In addition to her work with TLC, Left Eye recorded one solo studio album entitled “Supernova.” The record was released in the United Kingdom, Australia, Japan and China, but not in the United States. The singer was working on her second studio album at the time of her death. It was very sad to hear about Lisa’s death, has it been 9 years already??? I enjoyed most of TLC’s music. Rest in Peace, Lisa – she was a very interesting and unique young lady with a style that no other female rappers had during the 90’s that fit in TLC very well – and made them stand out differently from other groups during that time. Lisa “Left Eye” an extremely talented young woman, who was one of the best female rappers – (along with McLyte and The Brat). She had a personality that was fierce, charming and kind all rolled into one hellva young woman. The industry is missing her gifted talent.